Two of the best collaborations we did last year are back in stock this week. 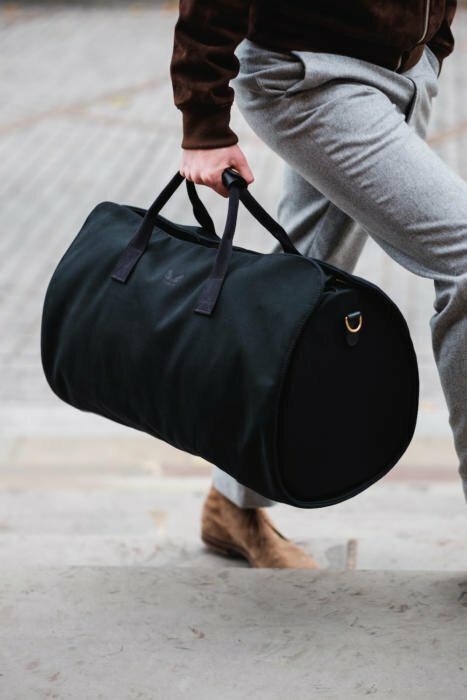 The Suit-Carrier Holdall (below), which combines a suit carrier and a holdall into a single lightweight bag, is available again on the Bennett Winch website. The Holdall was tremendously successful, with three runs last year all selling out, and the factory making nothing but holdalls throughout December. It is being launched to the wider press next week, so it's worth getting one now if you want one. 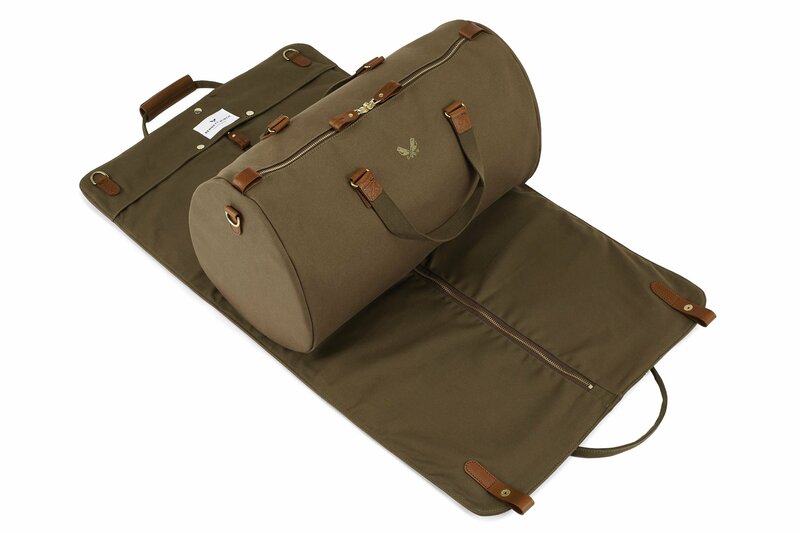 The bag is available in black and olive, costs £650, and is available through the Bennett Winch site (not the PS shop). More details on the bag and the process that went into it here. Second is the trench coat I helped design with Private White VC (above), which if anything was even more successful. That sold through two much larger runs last year, and is only now back in stock on the Permanent Style shop. We have just a couple in each size, so again these will go quickly. 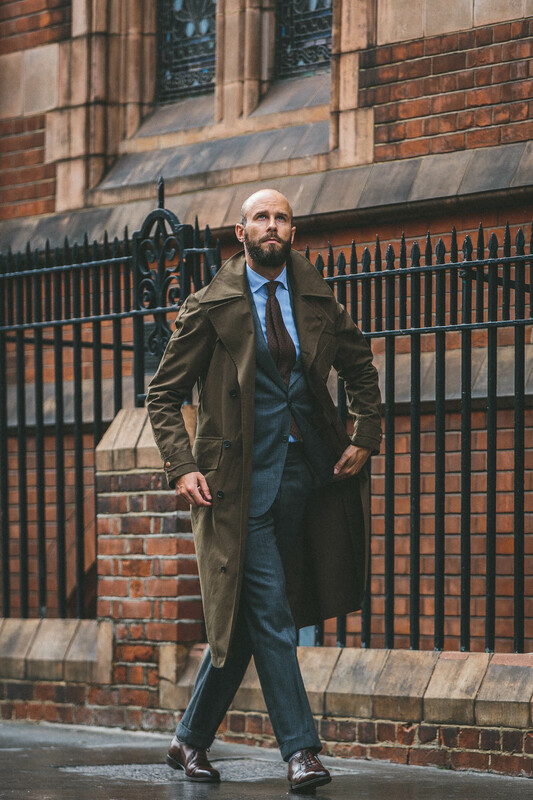 The coat was my ideal trench - long, made with materials that age beautifully, with strong details like a big collar and lapels, and in a colour that goes with both formal and informal clothing. It costs rather more at £1350 (including VAT, with a button-in liner) and is available on the PS shop. More details on its creation and functionality here. They were both such great products to create - satisfying and, in at least my wardrobe, filling an annoying gap. It's been lovely to see how well they've been taken up. 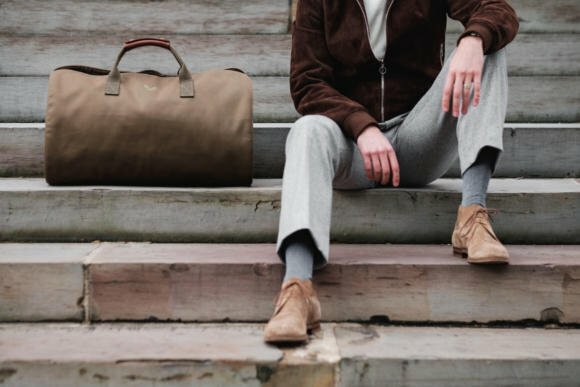 You can follow the discussion on Suit-carrier holdalls and Trench coats back in stock by entering your email address in the box below. You will then receive an email every time a new comment is added. These will also contain a link to a page where you can stop the alerts, and remove all of your related data from the site. I am no Simon sychofant but I have to say, ‘The Trenchcoat’ is a sartorial masterpiece. It completely redeemed him after his catastrophic love fest with that RL cardigan. Get one now and hats of to PWVC for their tremendous craftsmanship. I wore this in an absolute down pour the other week and emerged as dry as a bone and as cool as Alain Deleon. Does Bennett Winch have its own factory or does it sub-contract its manufacturing? Great coat but if I’m limited in my budget, would you say a wool long length overcoat is more essential than a Trench coat during Winter? I’m moving to the Netherlands soon, very cold and rains a lot like in UK. The main purpose of a trench coat is for protecting your clothes against rain right? Would a wool overcoat do the same trick with an umbrella? By the way, for overcoat sizing, would you suggest to buy one with an inch or so wider on the shoulder width if I’m wearing a suit or knitwear underneath? Like you, I want major garment pieces to be as versatile as possible. 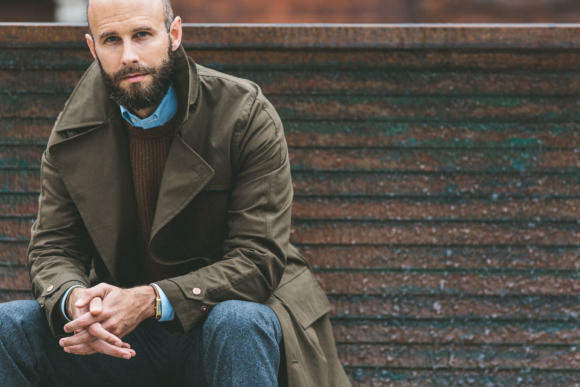 Yes, a proper overcoat is always going to be more useful. I got two overcoats from Drop93 as they were on massive sale. One from Attolini and one from Crombie. Try many on but only these two fit whether I was wearing a suit or just knitwear and shirt. They both look nice, and good value. Versatile colours, and pretty classic designs. I survived Aarhus in February in a lined trench 4 years ago. I think one evening I had a jumper and a down vest on. I am currently in Flanders; I make do with a lined trench and a short Margaret Howell jacket. My idea of very cold may differ from some, but I don’t think we see a lot of very cold weather in Western Europe these days. The trench will be useful all year; it rains all year! Medium went fast, any idea of a timeline for restock? Nice to see a strong response. Simon, i think you mentioned that you wear a small in the photos, but could also take a medium. Could you remind me what your approximate chest measurement is? I’m around 39 too – I’d go for medium. Will you be getting the watch cap back in stock? Any chance of doing it in black as well? Is it possible to Pre-Order/reserve/pay for the navy now? Men of significantly different heights can have the same size above the waist. Hence it would be very convenient to have coats(and perhaps suit jackets) unfinished at the bottom, not unlike trousers, so the buyer can have them finished to the length they prefer. For the shorter man that would make a tremendous difference in appearance. Your coat here, in many respects, looks wonderful . Can you imagine that size on a man 6 inches shorter? Simon, may I ask which colour of the SC holdall you personally went for, and why? I personally find the black-leather-on-black-canvas option rather boring; and while the olive has a nice rugged country look, I fear the colourway might not be versatile enough in terms of colour harmonies. I am still on BW’s waiting list, so I still have time to change my choice if need be 🙂 Your thoughts are much appreciated! Where would you recommend I buy overcoats and trench coats if I was on a budget of up to £250? I would love to buy something made in Britain if possible but would understand if that may be a bit out of reach so just wanted to see what your thoughts are on that. 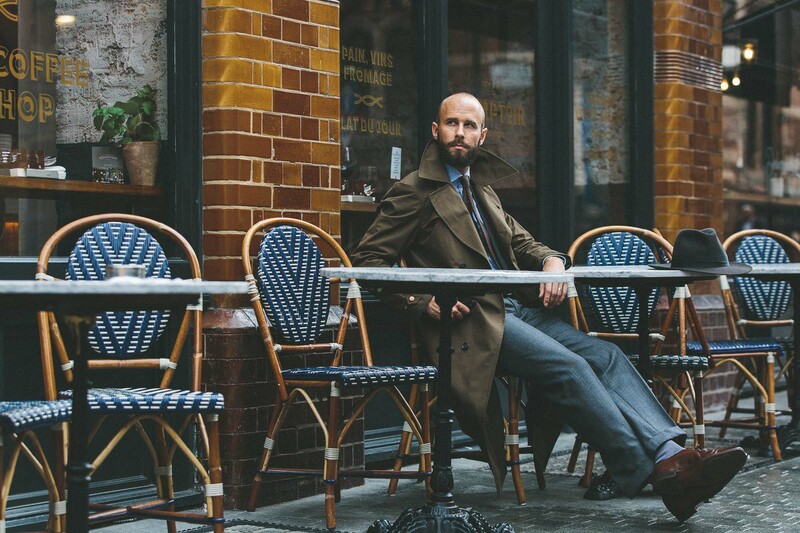 What would you say are the main trade shows for men’s smart casual and formal wear in London? It’s slightly off topic but I would be interested in your thoughts on the Private White VC website and pricing relaunch. They have introduced a Pricing Manifesto with a clear statement of their mark up. Most unusual approach. Standard pricing also seems to have been reduced. I am assuming they are trying to move away from the boom and bust of discounted pricing that afflicts so many luxury brands. Anyway, would appreciate your thoughts. I have your Trench Coat by the way. It is excellent and I do realise the pricing reflects the low volume and one off design. Thanks Stephen, really pleased you like the trench.